1. For the Rossini, heat a small frying pan and add a little of the butter/oil mix. 2. Cut the crusts off the bread and cut to the same size as the steak. Add the bread to the pan and toast on each side. 3. Heat a separate frying pan and add a splash of the oil/butter mix. Cook the steak to your liking. Remove from the pan and place on the toasted bread to rest. 4. In the pan, you cooked the steaks in, add the madeira. Deglaze the pan by scraping off the stuck-on parts from cooking the steak. 5. Cook until the volume of liquid is reduced by half then add the beef stock and peppercorns. Cook for 2-3 minutes, then strain through a fine sieve into a clean pan and finish with a knob of butter. 6. In a separate frying pan, add the remaining butter/oil and, once hot, add the wild mushrooms and cook for 2-3 minutes. 7. For the mash, place the potatoes into a large pan filled with cold water salt and bring to the boil. Cook for 15-20 minutes, or until the potatoes are soft. Get these underway first, then start the steaks! 8. Drain and mash the potatoes. Add milk and butter and mix to form a smooth mash. 9. To serve, add a few shavings of truffle to the sauce. Place a spoonful of the mash onto serving plates, place the bread and steak next to it and pour the sauce over the steaks. 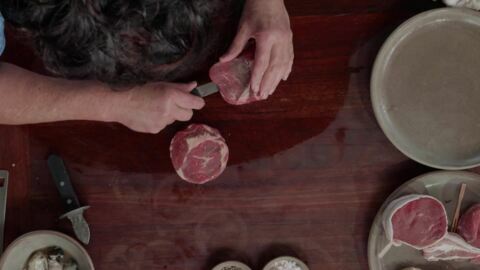 Finish with more truffle shavings and scatter the wild mushrooms around the steak.